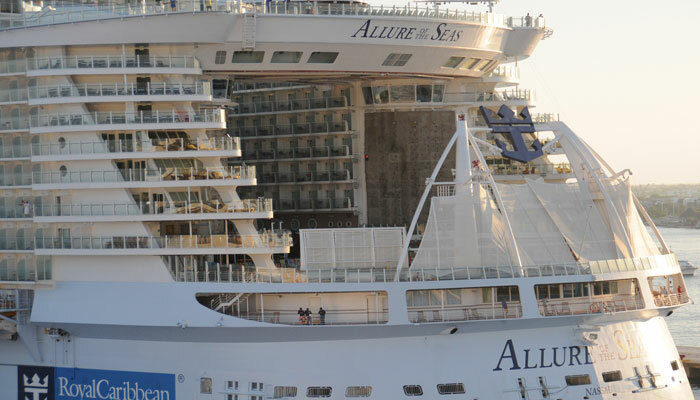 Allure of the Seas which is the largest cruise ship in the world operated by Royal Caribbean has been delayed due to a double medical emergency in Nassau, Bahamas. A crew member and a guest were ill onboard the 225,282 vessel, they both received medical attention in the ships medical facility but needed more urgent attention from a Hospital. This occurred on Monday, January 19th and the news first broke by @PTZtv where photos were posted of an ambulance meeting the ship at the dock with several officials near the gangway. Royal Caribbean has told Cruise Hive that the “ship altered its course and sailed to the closest port of call, Nassau, Bahamas” which is also part of the vessels itinerary. According to @PTZtv Allure of the Seas had just departed Nassau but then due to the double medical emergencies was forced to turn back around. Allure of the Seas is currently on a seven-night cruise that departed Port Everglades, Florida, on Sunday, January 18, and includes port calls to Nassau, Charlotte Amalie and Philipsburg, St. Maarten.